NORAD scrambled a pair of F-16 fighters when an intensely bright glowing orb appeared over Northeastern Pennsylvania. A spokesman for the military confirmed that missiles were fired at the object, but they apparently fell short of their target. Three of them exploded harmlessly over unpopulated areas. The last struck an outhouse north of Noxen. Fumes from that explosion forced nearby residents to evacuate, but no injuries were reported. Many residents of the region saw the mysterious object. A neighbor concurred. “I decided to cut my grass. I saw the danged thing just hanging there. I was outside for hours, and it hovered over me the whole time.” The man, who declined to give his name, said his bare back and arms were burned by the object’s intense radiation. Some residents claim to have seen similar objects over the area in the past. 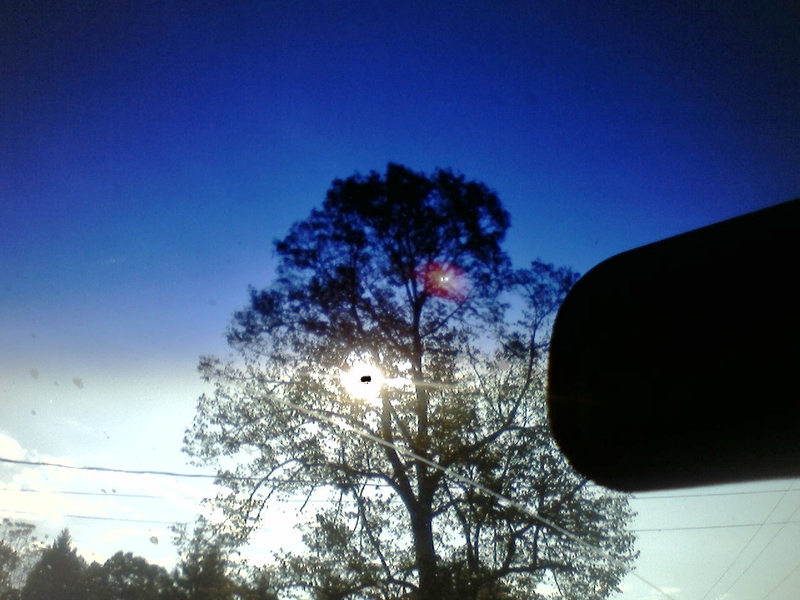 A Plains township man snapped a picture of the object on his way to work. First, I’m at 196.0 pounds (for anyone thinking I stopped posting because I was ballooning like Oprah fresh off a diet and binging on ding-dongs). Next, I’ve been doing a lot of behind-the-scenes political stuff. I’m the treasurer for three committees, and two of them had fundraisers over the past couple weeks. I also had to get my own campaign website up. My campaign is very low-key this year, but it will be heating up between now and Election Day. There were also writing projects I was behind on, and I had to catch up. I take my writing very seriously. It needs to be an income stream SOON. So with all that (and squeezing in the day job) there really hasn’t been much time to post. Heartfelt condolences go to my brother Bill and brother-in-law Jack on the demise of the Red Sox. Boston apparently choked to death and is out of the playoff picture. My wife, the Yankee fan, couldn’t be happier. Me? I could care less. I’m a die-hard Penn State fan. Joe will probably be coaching “another three or four years” when they pack me up and send me off to the old writer’s home. They love me in France. Looking at my audience stats, my number one overseas readers are the French. Latvians are a close 2nd (helped by a bizarre one-day spike where they came out of nowhere and briefly passed the French on the hit-o-meter). I'm waiting for a truly exotic location to show up, like Moldavia, Madagascar or East Orange, New Jersey. I wrote this back in 2004. America has changed dramatically over the last ten years, and one of the root causes of that change was 9/11. The financial cataclysms were still seven years away, but the September attacks were the beginning of seismic changes in America, changes which continue to unfold today. ...The day started out all wrong. My PC was on the fritz. By the time I fixed it I was running late for work. Driving to the office, my car radio stopped working. My old Ford had a loose radio wire, and I often had to jiggle it into just the right spot to make the radio work. About every third pothole, it would come loose, and I would have to fidget with it to find the "sweet spot." This particular morning, I couldn't find that sweet spot for the life of me, so I had no radio. I realized suddenly I also had no money for lunch. I stopped at a mini-mart ATM machine. The ATM was broken. My mood, already foul, was growing worse by the second as I walked back to my car. These silly things really seemed like big deals to me at the time. Back in my car, I took a few seconds to fiddle with the radio and finally got it working just in time to hear a plane had crashed into the World Trade Center. I looked at the sky…the Wyoming Valley is only about 130 miles from Manhattan. The day was gorgeous, the sky clear. I remember thinking, "…how on earth could this happen on such a perfect day?" As I pulled into the parking lot at work, the news broke that the second tower had just been hit. When I walked into the office, my boss exclaimed, "Did you hear what happened? A plane hit one of the World Trade Center towers!" "Another plane just hit the other one," I replied. I remember the shock on his face, likely mirroring my own. "How is an accident like that possible?" he asked. "It can't be an accident. It means we're at war." I answered. "It doesn't really matter," I sighed. What an odd answer I gave to such a straightforward question! I've never forgotten what I said. I remember everyone crowding into the cafeteria at work, watching the unfolding horror on the television set. Both towers were aflame. I went back to my office and refused to come out. I refused to watch the Towers fall. To this day, I have trouble watching the video. Lunchtime came, but I had no appetite. I got in the car and drove around town for half an hour. I crossed the bridge into West Pittston and drove slowly past the National Guard Armory. By then, of course, the Pentagon had been attacked. It was clear something terrible was unfolding, and that we were at war. 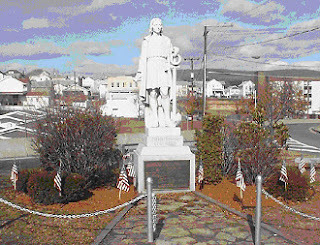 I crossed back over the river and drove past Columbus Circle in Pittston. My eyes filled when I saw a pair of elderly veterans placing flags in front of the monument there. Hunched over, solemn and deliberate, they worked slowly at their task. Driving home after work, thinking of the veterans again, I stopped to buy a flag. There were several other shoppers doing the same. There was none of the usual hustle-bustle you see in a department store. Everyone was quiet, considerate and polite to each other as we all in our own way struggled to come to grips with the day's events. Once home, my son and I worked by porch light to hang the flag. People drove by slowly to watch us work. Over the following days, I remember spending a lot of time outside in the yard, avoiding the TV and Internet and looking at the sky. Clear, beautiful blue September skies punctuated with the occasional cloud. Skies like those seen by countless generations of people for thousands of years. No crisscrossing latticework of contrails, no shiny specks hurtling high overhead. Just terrible and vast empty skies from horizon to horizon. I pray I never see them so empty ever again. Most of my week was spent at the office dealing with the unwelcome visit by tropical storm Lee. When I went into work on Wednesday morning, I had no idea I wouldn’t see home again until Thursday evening. When I did finally get home, I promptly crapped out on the couch. An hour or so later I fell off, landing right on my surgically reconstructed knees. Apparently nearly two hundred pounds of semi-conscious Irishman makes one hell of a thud when it hits the floor. I scared the bejesus out of my family. I haven’t fallen out of bed since I was a child, so I was red-faced. Fortunately I just bruised my knees. Usually when I fall I break something, so I feel lucky. I’ll just end up with some lovely Technicolor bruising, but no other harm done. My only thoughts now before I crawl into bed are with those who are struggling with this storm and its aftermath. I pray for them and for their families (and I really do believe prayer has an effect). I’ve got a bigger post coming on this past week, but I’m off to bed to recharge my batteries. Valley with a Heart: God Bless you and keep you safe. We were extraordinarily lucky that Hurricane Irene didn’t live up to its potential. The track of the storm was accurate. Had it hit the northeast as a category 2 or heaven forbid category 3 hurricane the damage would have been truly catastrophic. New York would be in a whole 'nother world of hurt. Instead it lashed the city that never sleeps as a tropical storm. Not that one should take tropical storms lightly. Our area in NEPA has seen what a nasty tropical storm can do. When Agnes struck it left our Valley in shambles. Irene was no slouch either. Vast swaths of the east coast had extensive power outages. In NEPA, some folks are only now able to make snow angels on their shower floors now that the hot water is back on. (Note to Michelle: scrub that shower stall first. Feet were there, and in my house the missus calls the EPA whenever I take my shoes off). I never had that sense of imminent catastrophe with Irene that I had with Katrina. I remember writing folks on my mailing list ahead of that storm to urge them to donate to the Red Cross. You only had to look at a map to see that hell was about to be unleashed on New Orleans. With Irene there was a sense early on that it was losing strength. But the storm was huge and hit hard despite its weakened state. I still take some exception to treating a potential catastrophe as a media event with days of build-up. People in the path of a storm for the first time feel like the end of their world approaches. When it doesn’t, I have to wonder how they’ll react next time. And there will be a next time, maybe in our lifetimes, maybe not. But a major hurricane will eventually hit the northeast with full fury. It doesn’t happen often but it does happen. And on that note, oddly enough, I switch to stimulus. I believe we missed a tremendous once-in-a-generation opportunity to use a stimulus wisely. What we did was throw money up in the air and hope it landed someplace useful. What we should have done was announce a mammoth initiative to protect New York and other major at-risk cities from hurricanes. Vastly upgrading seawalls to protect from once-in-a-hundred-year storms would have required manpower, heavy equipment, raw materials …the ripple effect across the nation would have been significant. Factories would have had to ramp up production and the factories that supply them would have had to ramp up production as well. Instead we filled potholes and hung up expensive signs at taxpayer expense telling Americans how ...um ...their tax dollars are being spent. In the end, Irene will fade from memory. Nothing will be done to protect New York City from the truly devastating storm that will surely come next month, next year, or next century. Just like nothing was done to protect New Orleans after Camille struck the Gulf Coast in 1969. Camille was a warning shot, but it spared the Big Easy and faded from memory. We missed an opportunity. What was that old commercial? You can pay me now, or pay me later. We’ll just pay later …it’s the American way. "...The Preamble of the Constitution notes promoting the general Welfare as necessary for a more perfect Union. Providing disaster relief to Americans promotes the general Welfare. Holding disaster relief hostage to spending cuts elsewhere undermines it. That's as plain as I can say it. Help our citizens first and with all possible speed. Haggle later. Why does this even need to be said?" I must end on an up-note: My son is having a pig roast Sunday. I expect some damages to my waistline. I do so without guilt. You don’t roast a pig every day!